Edsal high density stackable plastic storage bin. Premium quality stackable plastic bins are built to take the toughest abuse. 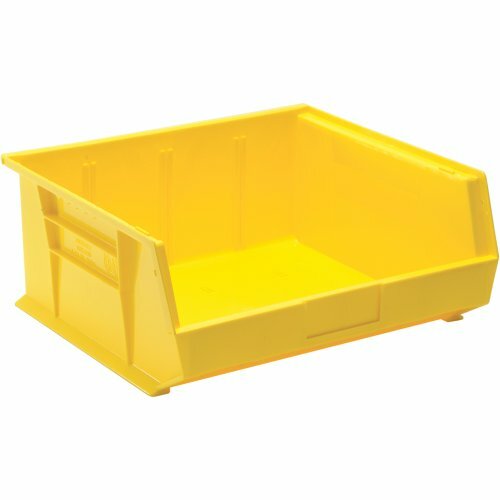 Extra thick bins are reinforced for rigidity and superior strength. Heavy duty polypropylene with permanent molded-in color. Virtually unbreakable, water rust and corrosion proof. Wide stacking ledge ensures stability and permits higher stacking. Full width hanger lip provides additional support. Anti-slide stop prevents shifting of bins when stacked. Inside front bottom is curved for easy retrieval. Built-in finger grip ensures more controlled handling. Plastic shelf. Measures 16-inches width by 7-inches height by 14-inches depth. Available in yellow color.